It's the 18th century - that dreamy era where emails, aeroplanes and GarageBand didn't exist, making long-distance communication, travel and self-taught composition very tedious. Maria 'Nannerl' (Maria Féret), the eldest daughter of the Mozart family, is feeling the weight of these hardships as her father, Leopold (Marc Barbé), bans her from playing the violin and refuses to give her the composition lessons she craves. In this male-dominated world, Nannerl's younger 'ten-year-old' brother, Wolfgang (David Moreau) â€“ who is actually twelve years old â€“ is the more bankable sibling. And so, Leopold continues to promote his son's talents like a mad stage-father as the Mozarts tour across Europe for a living. In Mozart's Sister - it should have been called Amadeus' Sister - Nannerl is the universal fifteen-year-old girl approaching childbearing age or, as they called it back then, 'womanhood.' She experiences her first menstrual event, receives her first kiss - from the Prince of France (Clovis Fouin) of all people â€“ burns a handwritten pornographic book, and acknowledges the fact that she will one day be wooed by the 'Wolf.' All this talk of sexuality and Riding-Hood-esque rite of passage may sound intriguing, but wait till Nannerl accidentally witnesses her parents having special cuddles in the bed close by. The highlights of the film would definitely have to be the scenes that involve Nannerl dressed as a boy in order to access the deepest corners of patriarchal society. She is in boy-form when she converses with the Dauphin, and also when she attends the composition classes at the Music Academy. Funnily enough, actress Maria Féret actually does look like a prepubescent boy when disguised - much like the way Amanda Bines passed as a chubby 'dude' in She's The Man. 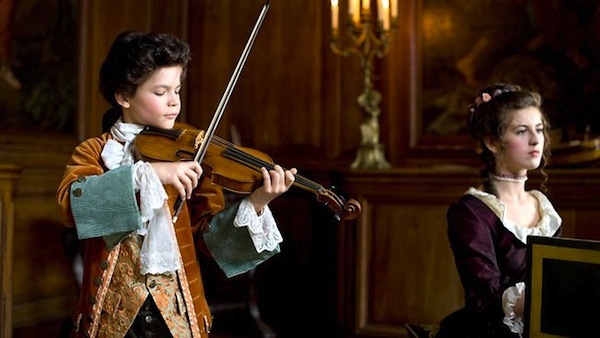 An aside: the prince's strange fascination with Nannerl as a boy is bound to get viewers' gaydars tingling. Other incidents worth mentioning are those that occur towards the end of the film. In the penultimate sequence, an OMG moment is seen as Nannerl burns all her compositional manuscripts out of heartbreak. Also, in the final scene, an eye-roll-inducing caption informs us that she will lead a miserable life of subservience to God, father and husband, only to ultimately die poor and blind. Yes, this is exactly the type of film that irritates hard-core feminists. Speaking of irritating, Mozart's Sister moves awkwardly at a very slow pace - played at lento, if you will. At first, this may seem like an artistic weakness, as it is enough to send the most action-oriented viewer to sleep. However, with the ending of the film in mind, we realise that perhaps the sluggish pace is supposed to symbolise the lack of career momentum women had in the 18th century. Arthouse lovers may compliment this tempo, likening it to the steady unfolding, and eventual drowning, of an origami flower on the surface of pond water. Overall, Mozart's Sister is an interesting project. 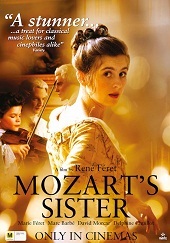 It's a period film shot mainly by a shaky hand-camera, and a biopic that chooses to focus on the other Mozart child. However, since we don't form any deep emotional connection with any character, it's more frustrating than tragic. If you were to ever watch Mozart's Sister on DVD - two-hours of gloominess - it'd probably be best to watch it as a double feature, alongside Coppola's Marie Antoinette, to revel in the colours and textures of all that couture with some fashion-friendly friends.